Spider plants are common indoor plants and can last generations. 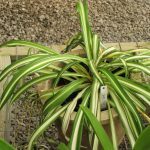 Their unfussy nature and lively “spiderettes” make an appealing and easy to grow houseplant. Spider plant problems are rare but are usually attributed to too much or too little moisture, excess fertilizer and occasionally insect pests can interfere with plant health. Treating plants with dark leaf tips starts with identifying the cause and then correcting any bad cultivation practices. Spider plants are graceful foliage plants. They are from tropical and southern Africa and cannot tolerate freezing temperatures. In warm climates, they are sometimes grown outdoors but in most regions they are grown as houseplants. The plants thrive in almost any light, soil type and temperature provided there are no freezes. Therefore, when a spider plant has black tips, water may be the most influencing factor. One of the most common issues with spider plants is water stress. This can mean too much or too little moisture. Plants should not be standing in a saucer of water and they need high enough humidity to avoid leaf tip burn. Overwatering is a cause of spider plant leaves turning black or dark brown. The soil should dry out slightly between irrigations. And to add more fuel to the fire, spider plants should not be allowed to dry out completely. If there isn’t enough moisture, the foliage will start to discolor, first at the tips. Often, the cause is due to situating the plant by a furnace or because it needs to be repotted. Root bound plants cannot uptake moisture effectively but simply moving the plant to a larger container often increases moisture absorption. Among the more common spider plant problems are necrotic leaf tips. The exact color of the discolored tip can be a clue to the issue. Reddish brown tips can indicate excess fluoride in your water, while tan to gray tips can mean the water is toxic with boron. If your municipality heavily treats water, treating plants with dark leaf tips may be as simple as using rainwater or filtered water to irrigate your plant. You can also use distilled water as an alternative. Flush the soil well with the new water to leach out the toxic substances and any excess fertilizer buildup. When a spider plant has black tips it is best to start with the water first and move on to other potential causes as this is an easy fix. Disease is a big possibility of leaf tips turning black on spider plant. Bacterial leaf blight starts out as light lesions on the leaf tips which gradually turn brown. Bacterial leaf spot and tip burn occurs in hot, humid conditions and is characterized by yellowing in the leaf margin and browning edges. Increasing circulation, avoiding overhead watering and removing damaged foliage can help prevent the spread of these diseases. Plants also need superior care to withstand the stress of the disease and produce new healthy foliage. If the disease has progressed to the point it is affecting the stems, the plant is going to die and should be disposed of.